The first Everest Summiter from South–East side of Nepal in Kirant Khaling Rai community as being a guide. He is originally from the Everest Region. In spite of being raised in a rural place he had nothing to lose but everything to gain. He started his journey being normal Trekking guide assistant to gradually becoming a senior guide from Rai community that leads many dreams to the world’s highest mountains. He had guided French, German, Spanish, Italian, Russian, Belgium, Swiss, Austrian, Japanese, Chinese, Korean, Thai, Australian, American, British, African, Canadian and Indian. To boost his career as being interested in mountaineering he had put a lot of hard work on the training and course in his journey. “If you talk to someone in their own language, that will go straight to their heart” and Mr. Chandra knows that exactly, and not only being native to one language, he has learned multiple languages such as English, Spanish, and French which helps him to connect to the client in their own words. Since 2018 with standard service, Mr. Chandra has started teaching about Ice, Rock, indoor wall climbing and Mountaineering Education. He had been working since 2001 in these multi outdoor adventure field or Nepal tourism industry especially for Trekking, peak climbing, expedition, tours, ice climbing, rock climbing, cycling and motor biking. Currently talking about his work, since 2018 Chandra started working under the Nepal Government-Affiliated Travel Tourism as guiding other countries such as China and Tibet. As matter of fact, Mr. Chandra has also an experience of having more than 2 dozens Trekking Peaks, and the Expeditions of Himlung, Kanchanjangha, Everest, and has surprisingly trekked all over Nepal. As talking about his trekking detail, in Western Region, he had trekked in Lower Dolpo, Upper Dolpo and Inner Dolpo, Rara Jumla, Simikot Upper Mustang, Lower Mustang, and Nar Phu Manang. Whereas in Eastern Region, he had trekked in Kanchenjunga, Ilam, Makalu, Arun valley, and in North, he has been to Everest Khumbu region Rolwaling and Langtang. Trekking Guide Course: In 2004 from the MoCTCA (Ministry of Culture/ Tourism and Civil Aviation) & NATHM (NEPAL ACADEMY OF TOURISM AND HOTEL MANAGEMENT) with Grading – A. Beginning, Ice Climbing Course: In 2011 from KCC (Khumbu Climbing Centre). Introductory Mountaineering Guide Course: Basic Rescue Training in 2011 from NMIA (Nepal Mountaineering Instructor Association). Basic Mountaineering Course: In 2011 from Nepal Mountaineering Association (NMA). 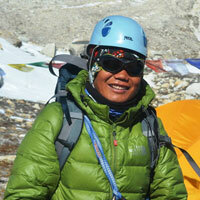 Advance Mountaineering Training: In 2013/2014 from Nepal Mountaineering Association (NMA). First aid Course, Nepal Red Cross Society: 2013. Rock Climbing Course Level 1: In 2014 from Nepal Mountaineering Instructor Association (NMIA). High Mountain Rescue Training: In 2015 from Nepal Mountaineering Instructor Association (NMIA). Ice Climbing Training Level 1: In 2015 from Nepal Mountaineering Instructor Association (NMIA).